1 December 1894: born in Tôkyô outside the Kabuki world. His father, Kitagami Gennosuke, was in the electric appliances business. 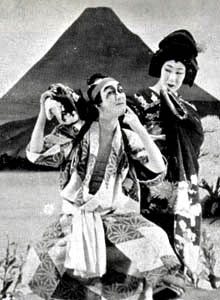 October 1908: first stage appearance, in Tôkyô at the Meijiza. 1910: he settled in Ôsaka and became a disciple of Kataoka Nizaemon XI, who gave him the name of Kataoka Tônosuke. October 1917: Tônosuke went back to Tôkyô and became nadai. 4 October 1927: the actor Arashi Kichisaburô VI died. February 1928: he went back to Ôsaka and took the name of Arashi Kichisaburô VII at the Nakaza. March 1934: "Ôishi Saigo no Ichinichi", the tenth and last play of Mayama Seika's cycle "Genroku Chûshingura" was staged for the first time in Ôsaka and in Kyôto, at the Naniwaza from the 3rd to 16th of March [casting] and at the Minamiza from the 17th to the 27th of March [casting]; Kichisaburô played the role of Araki Jûzaemon. 16 October 1934: his master Kataoka Nizaemon XI died. March 1953: he joined the first league of actors in Kamigata ("kanbu shôshin"). August 1953: revival of Chikamatsu Monzaemon's masterpiece "Sonezaki Shinjû" at the Shinbashi Enbujô; Kichisaburô played the role of Aburaya Kuheiji [more details]. April 1954: revival (the 1st since the end of WW2) at the Nakaza of Katsu Genzô III's drama "Ogasawara Sôdô"; Kichisaburô played the role of Inugami Hyôbu [casting]. May 1968: revival at the National Theatre of "Ura Omote Sendai Hagi"; Kichisaburô played the role of Watanabe Gekizaemon [casting]. January 1973: Kichisaburô appeared on stage for the last time, at the Ôsaka Shinkabukiza, playing the role of Kawatsura Hôgen in the drama "Yoshitsune Senbon Zakura". 11 February 1973: Kichisaburô died. Arashi Kichisaburô VII was a versatile supporting tachiyaku actor. Although he was not born in Kansai, he was considered as a Kamigata actor. His most notable performances were the roles of Aburaya Kuheiji ("Sonezaki Shinjû" - he played it more than 500 times! ), Shundô Genba ("Terakoya"), Tsuribune Sabu ("Natsu Matsuri"), Shibata Jûdayû ("Banchô Sarayashiki"), Hansai ("Obiya") and Yakushiji Jirozaemon ("Kanadehon Chûshingura"). Arashi Kichisaburô VII (left) playing the role of Sagisaka Bannai in the dance-drama "Yoshinoyama"